PORTABLE AND LIGHTWEIGHT - Diameter 34.25inch (87cm), Folds down to 10.24inch (26cm), Weight: 13.05oz (370g). This excellent umbrella is the perfect item of protection durability, portability. As you can see it is small enough to storage in your tote and bag. PROTECTION FOR EXTREME WEATHER - This travel umbrellas was made from sturdy steel and quality waterproof cloth, the umbrella is highly durable and capable of withstanding strong winds and rains, and keep you and your belongings dry even during the toughest storms. EVERYTHING JUST TO SUNBLOCK - UVA is the real killer of the skin, the strong wave ultraviolet in UVA can directly penetrate the dermis, collagen fracture cause stimulate melanin, to make the skin senility. Yamix sunshade umbrella has the UV (Ultraviolet) protection layer inside, it will be 99% UVA blocked, you will never worry about sunburn. STURDINESS AND DURABILITY- Strong sturdy steel and durable ribs withstand high winds and prevent the umbrella from flipping inside out. 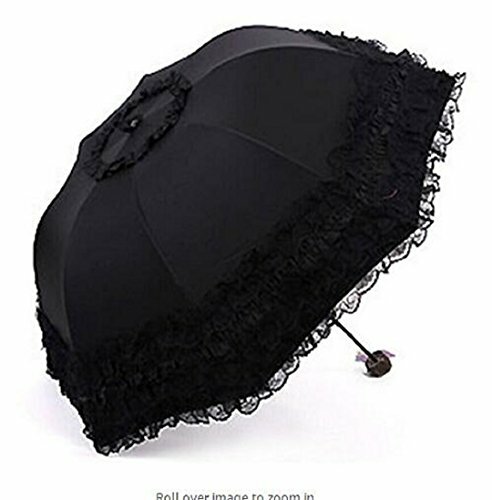 CHEERS YOU UP - The beautiful three dimensional lace umbrella will surely cheers you up in any dismal weather. UNIQUE GIFTS for wedding, birthday, engagement, anniversary, women, mom, sister, grilfriend, best friends and your fere etc. If you have any questions about this product by Wendin, contact us by completing and submitting the form below. If you are looking for a specif part number, please include it with your message.